Hospital Digital signage can decrease confusion while efficiently guiding patients and visitors through your facility with interactive building maps and facility directories. Advanced technology, like digital signage, helps differentiate your medical facility and is an attractive method to direct visitors to their destination while promoting health messages, upcoming events and classes, cafeteria menus and hospital specialties. 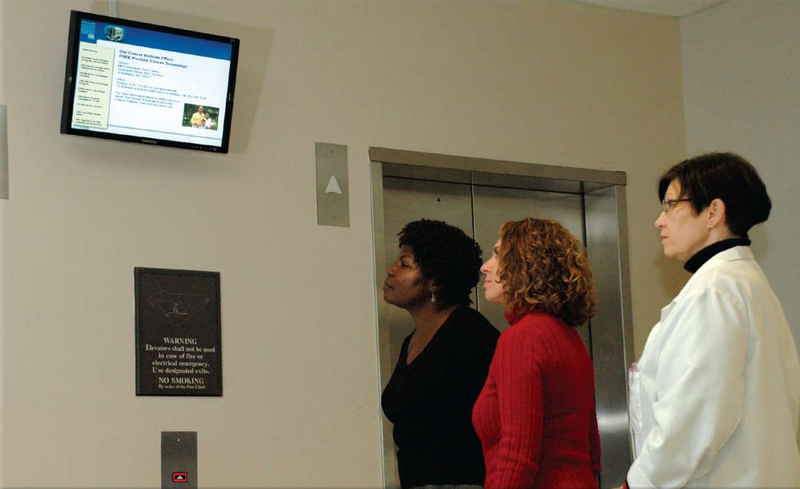 Hospital Digital Signage can help tell visitors and patients where to go. This helps to improve patient satisfaction and increasing the chance that they will arrive at their appointment on time. Hospital Digital signage can be placed in areas where visitors may be waiting. In these areas, digital signage can easily deliver facility information, present preventative health programming and advertise products and services. By placing digital signage displays in waiting areas throughout your health system, you can help make the wait more enjoyable for patients and those accompanying them. These displays typically carry a mix of news, health and wellness information, and your own promotional content. By placing digital signs in break rooms and other common areas across your health system, you can help staff members learn about new office policies, updated safety procedures, new treatments being offered, and more. In cases where you need to make sure that each employee views the content, interactive kiosks provide self-directed viewing and automated skills testing. Compliance reports are then submitted electronically to your database. Digital Signage can be placed within the hospital at many locations. Some popular locations to place digital signage in the hospital is at building lobbies, check-in and registration areas, emergency rooms, waiting rooms, elevators, cafeteria's and even donor recognition areas. Need Digital Signage for your hospital?